It seems like anything shiny is popular this season. What was once upon a time a loved fabric of the workers of the night has turned out to be one of the most popular fashion trends of Winter 2016-17, worn by the greatest street styles and celebrities. Yes, ladies, you heard it... The vinyl trend is here and it's here to conquer every fashion girl's closet. Just do me a favor... don't go shopping with your mom when you shop for your first vinyl pants, she might get the wrong idea... I happen to think that it'll make you stand out, in the good way, and that its a great statement fabric that will make you look like a real-time barbie. I would style my vinyl pants with a turtleneck sweater and some kickass heeled booties. 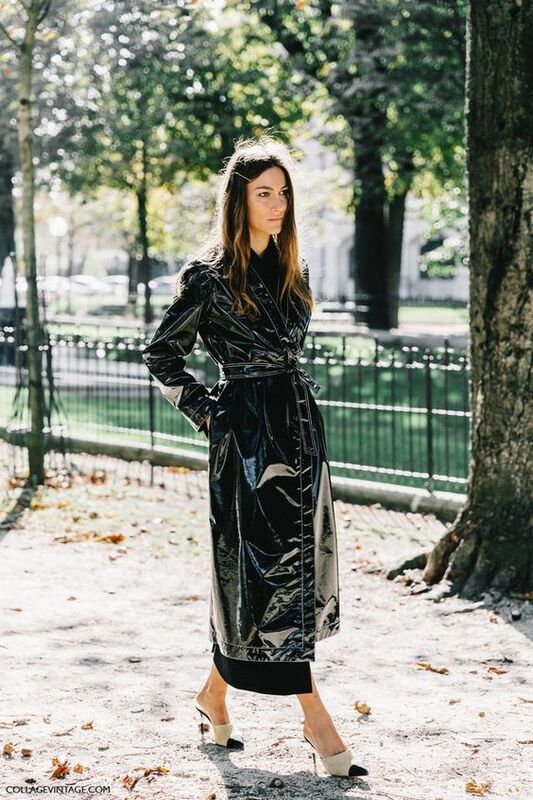 If you want to totally go for it, add a leather jacket, but if you want to tone it down (which is probably the better option, depends on the occasion) then wear it with a classic trench (preferably black). Don't forger those statement earrings that are oh-so-popular right now, and not to mention the statement bag. If I had to style this look while raiding the Vogue closet then I would have to pick a classic Givenchy Antigona bag, and a black leather studded belt that would only peek from underneath the sweater. Scroll down for more styling inspirations.